Seller will review all offers Feb 23 2018. 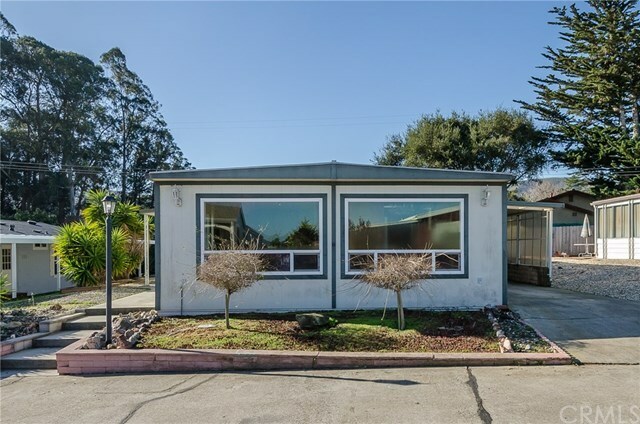 This 1970 Gold Medal Lakewood mobile model offers 2 bedroom, 2 bath floor plan,a built-in hutch in the dining area, garden tub in the master bath, covered carport, shed, and it has forced air gas heat, plus upgraded windows. The home abuts the state oak preserve adjacent to Daisy Hill Estates -- a 22.5 acre 55+ senior community. The park is located at the southern end of Morro Bay Estuary and is approx. 5 miles from Montana De Oro State Park and approx. 12 miles from the city of San Luis Obispo. Daisy Hill Estates Senior Park backs to a state oak preserve offering walking paths native oaks, and abundant wildlife. Park amenities include: Clubhouse with TV and kitchen, pool room, swim spa, multipurpose room with ping pong table, exercise space, library,pool table, laundry room, and RV rental storage. Social functions include bingo, monthly potlucks/breakfasts, BBQs, women’s luncheons, men’s coffee club, holiday diners, card games, Wii bowling leagues, and other activities. Pet friendly park. HOA $137.50 monthly occupancy fee supports park operations, maintenance and twice weekly trash service. Check with the park for ownership details.